The Second Age: Graphic Photos: To Publish or Not to Publish? Graphic Photos: To Publish or Not to Publish? Note: This post is about graphic images and prominently displays a graphic image from last Monday's marathon bombing that some media outlets deemed too graphic to fully publish. 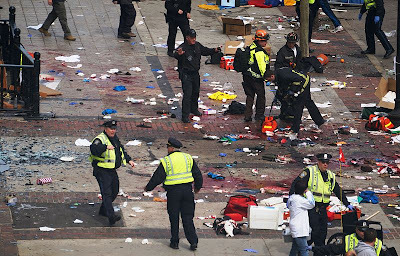 A debate has popped up recently over the ethics of publishing gruesome photos like those of Marathon Bombing victim Jeff Bauman. Some have said that publishing these photos is in poor taste because of the gore that it subjects its viewers to. The Daily News even went so far as to alter one image of the bloody scene to make it less graphic. Before getting into the merits of publishing gut-wrenching photos, it is pretty obvious that the altering of press photographs is inherently wrong. The consensus is you either run the photo or not, but sneakily editing it the way that the Daily News did is never the right thing to do. That said, the true debate is whether some photos are so gruesome that they should not be run at all. I feel that it is an editorial decision and arguments can certainly be made either way. If an editor is not comfortable running a photo because he/she feels it is too gory and could disturb some viewers I have no problem with that. They know their audience and should have the authority to make that decision and should not be forced to run a photo with which they are not comfortable. I personally feel, however, that running photos that may make some squeamish has some benefits. In the photo on the left we see a dazed spectator in a wheelchair in shock at what just happened. He doesn't seem to be fully aware of what is going on, but it may not cross the viewer's mind that Bauman has suffered a devastating life-threatening injury. The photo on the right gives the viewer a completely different reaction than the one on the left. It is visceral and hits the viewer right in the stomach. It also further highlights the heroic actions of the EMT, the woman pushing the wheelchair, and Carlos Arredondo, the bystander in the cowboy hat. These are the realities of the horror visited upon Boston recently. As you can tell, the Washington Post decided to run the cropped version, while The Atlantic ran the full photo. This debate is not new. Back during the Gulf War Ken Jarecke took a graphic photograph of a burned-up Iraqi solider on the "Highway of Death" and the AP in New York pulled it off the wire, deeming it too graphic. The picture ran in some British outlets, leading to a debate about publishing disturbing images. Ken's feeling was "If I don't make pictures like this, people like my mother will think what they see in war is what they see in movies." Portrayals of cold, hard reality have also spurred action in the past. The unforgettable image of an unrecognizable 14 year old Emmett Till laying in his casket, having been kidnapped and murdered four days earlier, showed the harsh realities of racially-motivated violence in the South and helped lead a push to pass the Civil Rights Act of 1957. When asked why she did not have the funeral home do any cosmetic work on her son, Mamie Bradley said, "I wanted the world to see what they did to my baby." Our response to events is often driven by a reaction to what we see on television and in the press. If our exposure to these atrocities are toned down, we run the risk of hamstringing our response as well. Words are excellent descriptors, but even the most eloquent descriptions of a tragedy can fall short of a simple photograph.